Sacred art usually comes from divine inspiration through movements of the Holy Spirit. Even if it’s from His prompting, God generously leaves plenty of room for interpretation in the execution. Although, most artists don’t feel an overwhelming urge to create a piece as specifically dictated by God. There is a small group of people convinced they have seen God in images of food and other random experiences, but it’s not a common occurrence. In fact, we only have 2 images given to us by God. The first is a burial cloth relic from the crucifixion of Jesus known as the Shroud of Turin. The second is the miraculous image of Our Lady of Guadalupe on Juan Diego’s tilma. Both are images given and left for us as gifts and signs that point to heaven. Both are miraculous images created directly by the Lord. There was a time when we the Hebrews created the Ark of the Covenant according to the commands of God (Exodus 25). This is always an important note we cannot forget when there are questions about whether God allows the use of sacred art. Unfortunately, we lost the Ark when Jeremiah buried it to keep it protected (2 Macc 2:4-10). Today, we are blessed to have an image painted by human hands under specific instruction from the Lord. The two rays denote Blood and Water. The pale ray stands for the Water which makes souls righteous. The red ray stands for the Blood which is the life of souls. These two rays issued forth from the depths of My tender mercy when My agonized Heart was opened by a lance on the Cross. Happy is the one who will dwell in their shelter, for the just hand of God shall not lay hold of him (299). By means of this image I shall grant many graces to souls. It is to be a reminder of the demands of My mercy, because even the strongest faith is of no avail without works (742). Jesus knows the depths of our hearts, and this image is intended to communicate His love and mercy. We are given the gift to be able to look into the face of love and feel His Divine Mercy bless us. Blessed Michael Sopoćko, the confessor and spiritual director of St Faustina, commissioned Eugene Kazimierowski to paint the original image in 1934. Eugene Kazimierowski was the artist who painted the first Image of Divine Mercy that currently hangs in the Shrine of Divine Mercy in Vilnius, Lithuania. This was the only version of the painting that St Faustina saw in her life. Kazimierowski was a native Polish painter that was known for his landscapes and portraits. When he was first commissioned by Fr. Sopoćko, Faustina asked for various revisions of the image because she didn’t feel it capture the likeness of Jesus very well. Understandably, this left Eugene Kazimierowski very distraught at his inability to please her expectations. Finally, Jesus had to tone down her expectations and remind her that it pleased Him as it was painted. She never felt that it compared to the radiant beauty He possessed, but she finally came to accept that a painting would never compare to the real experience. The original Vilnius version of the image was restored in 2012, in the Year of Faith. There are many different versions, but Jesus specified that the theme is the most important part. The are three most popular versions, but each is equal in dignity and graces. Painted in 1934 by Eugene Kazimierowski under the direction and oversight of Bl. Michal Sopoćko and St. Faustina. This version was painted by Adolf Hyła in 1943, 5 years after the death of St Faustina, under the direction of her other confessor, JózefAndrasz. This version is somewhat based off of the Vilnius version, but Jesus has a more general European face that has made this version very popular around the world. The details in Jesus’ walk, benediction, and expression are also enhanced in this version. The original Hyla was painted for the Divine Mercy Sanctuary in Kraków. The first version has more detail in the background, and even contained more landscape until it was edited to look more liturgically appropriate. This is the newest of the most popular Divine Mercy Image versions, painted by American Robert Skemp in 1982. It uniquely places Jesus at a doorway with the rays coming out directly at the viewer. This image is closely related to the Gospel readings from the Second Sunday of Easter where Jesus appears to the Apostles to bestow upon them the power to forgive sins in John 20. There is also a special point about the doubt of St Thomas, and Jesus desire for Thomas to trust in Him. In this Gospel reading, Thomas wishes to touch the pierced side and hands in order to have no doubt that it is Jesus. This same piercing is the source of the rays of light in the image. There is an interesting connection, or even a Divine Coincidence, between the Shroud and the first Divine Mercy Image.When the Divine Mercy Image is overlaid on the face of Jesus on the Shroud of Turin, we see a beautiful composite that shows that the features and proportions align. This is as close as we can get to a photograph of the face of Jesus. When the Divine Mercy Image is overlaid on the face of Jesus on the 1966 high-resolution image of the Shroud of Turin, we see a beautiful composite that shows that the features and proportions align. This is as close as we can get to a photograph of the face of Jesus. I promise that the soul that will venerate this image will not perish. I also promise victory over [its] enemies already here on earth, especially at the hour of death. I Myself will defend it as My own glory (Diary, 48). Jesus promised many graces through this image as shared from the diary above. There have been many attributed miraculous healings and blessings from venerating the image of Divine Mercy. This truly is far more than just a picture of Jesus. 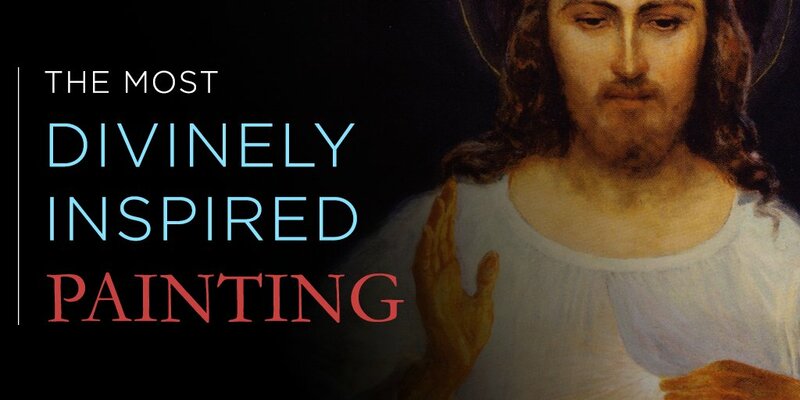 You can buy your own Divine Mercy Image on canvas in multiple sizes to bless your home at DivineMercyArt.com.